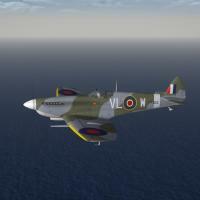 A reskinning of the stock 3W Spitfire 9e to No. 332 "Netherlands" Squadron during WW2 in Western Europe. Skins remain in their 'lorez' 512 size, and are still in bmp format. Decal randomization is set to TRUE. All marking on the aircraft, excepting the Sky fuselage band are decals. This will make it exceptionally easy for skinners to create other RAF squadrons of this time period. Included are modified data and loadout inis, at the current (7/2013) patch level. See 'changes' in the Notes section for full listing. And, for you viewing pleasure, a brand NEW SF2-style Hangar screen. The assumption (oh! that word!!) is being made that you've already made the aircraft player flyable, so no cockpit bits are included. Neither is my "One Click Restore Main Ini" (patent pending). No weapons or pilot figures are included; you should have them already. However, the AvHistory Merlin engine sound, is. As always, fairly easy to follow, yet detailed install instructions are included. So, please read them. Also, give the "Notes" section a read too.